Samsung unveiled a bunch of smartphones – Galaxy S10, S10 Plus, S10e, and the foldable Galaxy Fold at its Unpacked event last month. The Galaxy S series phones have already hit the store shelves and are flying off the shelves, but the Galaxy Fold is expected to launch on April 26th. While the sky-high price tag of Galaxy Fold puts it beyond the reach of most customers, some people with fat pockets might be confused whether to buy the top-of-the-line Galaxy S10 Plus or wait for the Galaxy Fold. Here’s our detailed Galaxy S10 Plus vs Galaxy Fold comparison to help you decide. 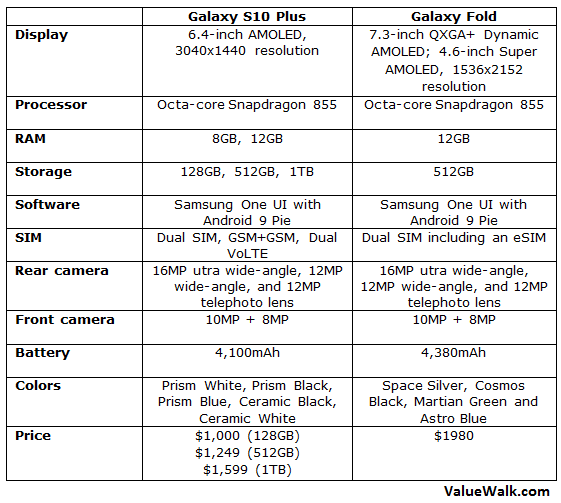 Most people have already made up their minds to buy one of the Galaxy S10 series handsets. But people who like using the bleeding edge hardware would be more interested in the Galaxy Fold. Its foldable design is a big draw for them. The Fold has one 4.6-inch display on the outside to give you quick access to apps. When you unfold it like a book, there is a larger, tablet-like 7.3-inch display on the inside. The Galaxy Fold’s inner display features an iPhone X-like notch that is big enough to irritate you. The notch accommodates a couple of camera lenses and other sensors. The device has a sturdy backbone with a hinge system that has multiple interlocking gears. Beautifully hidden on the rear, the gears allow you to fold and unfold the device. Samsung claims you could fold the display at least 200,000 times without causing any damage to the screen. The Galaxy Fold comes in Space Silver, Cosmo Black, Martian Green, and Astro Blue colors. In comparison, the Galaxy S10 Plus is available in Prism White, Prism Black, Prism Blue, Ceramic Black, and Ceramic White. The S10 Plus has ditched the notch in favor of a punch-hole Infinity-O display to expand the usable screen area. The display has two holes in the top-right corner to accommodate the selfie cameras. It has a nearly bezel-less design and a curved display. The Galaxy S10 Plus measures 157.6×74.1×7.8 mm and weighs 175g. Samsung has been a global leader in OLED technology, and its phones have always been praised for their screens. The Galaxy S10 Plus is no exception. It gets a gorgeous 6.4-inch AMOLED display with a resolution of 3,040×1,440 pixels. It has a pixel density of 438ppi. It also supports HDR+ to offer a better video watching experience. The Galaxy Fold bends like a book. It gets a smaller 4.6-inch display with HD+ resolution and 12:9 aspect ratio on the outside. The external display is surrounded by thick bezels. Unfold it and you’ll see a gorgeous 7.3-inch tablet screen with QXGA+ resolution and 4.2:3 aspect ratio. 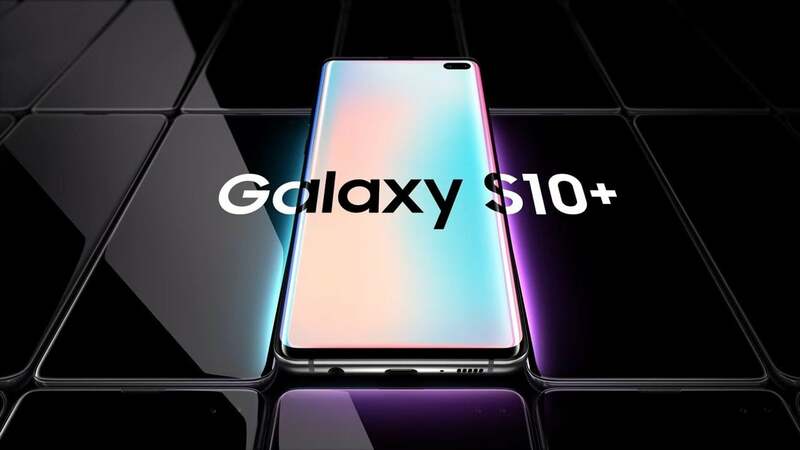 Samsung has equipped the Galaxy S10 Plus with Qualcomm’s latest octa-core Snapdragon 855 chipset in the United States and its own Exynos 9820 processor in most other markets. Both the chips are more powerful than their respective predecessors. The S10 Plus comes in 8GB and 12GB RAM options. You can get them with 128GB, 512GB or 1TB of internal storage. There is also a microSD card slot that supports up to 512GB of external storage. The Galaxy Fold runs the same Snapdragon 855 processor as the S10 Plus, and packs a giant 12GB RAM that is available only on the most expensive variant of S10 Plus. It gets 512GB of storage. It’s worth pointing out that the Fold features the brand new UFS 3.0 storage for fast speeds, while the S10 Plus comes with older UFS 2.1 storage. Samsung’s flagship phones are among the best smartphone cameras in the world. The Galaxy S10 Plus packs triple cameras on the back and dual cameras on the front for selfies. The rear camera setup consists of a 16-megapixel ultra-wide-angle lens, a 12MP wide-angle lens, and a 12MP telephoto lens. On the front, it gets a 10MP sensor and an 8MP lens. The Galaxy Fold has the same triple camera setup on the back with same lenses. You can use them in both tablet and phone modes. The dual front cameras on the Fold are also the same as the S10 Plus. But the Fold gets an additional 10MP selfie camera on the external display to let you capture selfies without having to unfold the device. Yes, the Galaxy Fold as a total of six cameras. The Galaxy S10 Plus packs a giant 4,100mAh battery with fast charging, wireless charging, and bi-directional charging technologies. You could use your S10 Plus to charge other compatible devices and accessories by placing them on the back of S10 Plus. The battery is large enough to get you through a full day of normal-to-heavy usage. The Galaxy Fold houses two batteries that are separated by the fold. However, the Android software combines them to represent a total of 4,380mAh battery. Only real world tests will tell whether the battery is sufficient to get you through a full day considering it has to power two giant screens. Both the S10 Plus and Galaxy Fold run Samsung’s new One UI skin on top of Android 9 Pie. The One UI is designed to offer an intuitive experience on phones with larger displays. It displays content in the top half of the screen and navigation options near the bottom to ensure that they are within the reach of your thumb. Samsung worked with Google to optimize the software for Galaxy Fold. The foldable phone can run three apps simultaneously. It can also smoothly transition apps from the external display to the internal one when you unfold the device. Several popular apps including YouTube and WhatsApp have already been optimized for the Galaxy Fold interface. The Galaxy S10 Plus starts at $1,000 for the 128GB storage option, goes up to $1,250 for the 512GB variant. If you want to buy the 1TB storage model with 12GB RAM, it’s going to cost you $1,599. By comparison, the Galaxy Fold costs $1,980, putting it out of the reach of most users. Samsung will release a 5G model of Galaxy Fold later this year, which could have an even higher price tag. The Korean company is expected to start shipping it on April 26th.